Some children hold the pencil with a poor pencil grip. This may affect their ability to write neatly and at a reasonable speed. This page explores (and displays) some of the issues behind a poor pencil grasp. 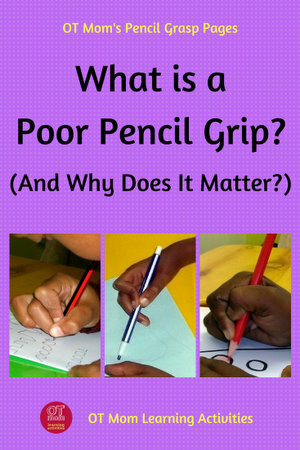 When is a pencil grasp considered to be poor? 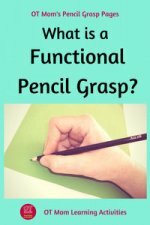 Immature pencil grasp vs Dysfunctional pencil grasp – what’s the difference? Why do kids develop dysfunctional pencil grasps? Contributes to untidy work owing to any of the above factors. Because all the factors above relate to function, I prefer the term "dysfunctional" to describe the pencil grip, rather than saying it is a wrong pencil grip. Be careful not to confuse an immature pencil grasp with a dysfunctional pencil grasp! Children need to move through the various developmental stages of holding a crayon or pencil before they are ready to control a pencil for handwriting. 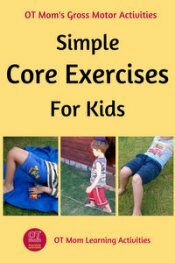 For each stage of learning to hold and use a crayon, the child needs to have the required upper body stability AND hand strength AND hand dexterity. 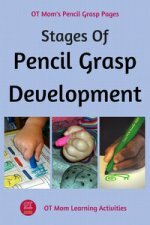 Take a look at my page on pencil grasp development and see if your child’s pencil grip is at any of these stages. If so, your child's pencil grip may be considered immature. 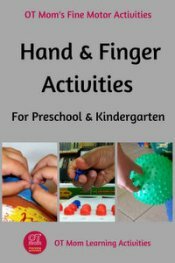 Children whose grips are immature often just need focused activities and a little more time to help them strengthen their bodies and their hands. However, time alone may not help your child develop a functional pencil grasp if he/she is already behind his/her peers. I offer lots of fine motor activity ideas on my site and in my e-books to help kids develop their skills, but if you or your child’s teacher are in any way concerned about an inappropriately immature pencil grip, please get an occupational therapy evaluation. Why Do Kids Develop Poor Grasps? 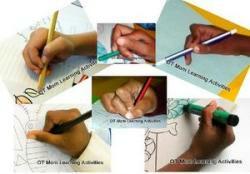 A dysfunctional or poor pencil grip often develops as a compensation for another skill which is weak. 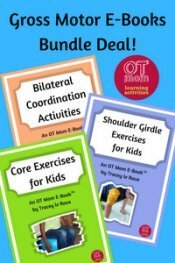 I like to talk about the four essential bases for fine motor development – if any of these bases is not well developed, the child may end up compensating for the lack of skills with a poor pencil grip. I think of these grips compensatory pencil grips. Sometimes kids end up with very distorted pencil grips. I have a few pics of these in my gallery below. Most of the kids who display these distorted, poor pencil grips were deprived of early fine motor experiences, for reasons such as a poor socio-economic situation, or illness, or disability. Sometimes the distorted grip developed because a well-meaning caregiver tried to make them hold the pencil with 3 fingers before they were developmentally able to do so. Forcing a child to hold a pencil with a "mature" grasp before they are ready to do so, can often result in a distorted grip, as the hand compensates to try and hold the pencil steadily. The photos below are meant to educate and illustrate. This page does not serve as a substitute for occupational therapy intervention. If you are in any way concerned about your child’s pencil grip, please seek a professional opinion. This child has a very stiff (static) pencil grip. He uses wrist movements to write, instead of finger movements. This child may be compensating for weak and uncoordinated hand muscles. Although this girl uses a tripod grip on her pencil, her ring and little fingers are held stiffly out to the side. This is very tiring and can lead to aching hands while writing. Learning to tuck the ring and little fingers in could help her. The “wrapped thumb” is a common sight. Sometimes this is a bad habit, but a lack of good shoulder stability, poor tactile perception, or weak hand muscles can also lead to a wrapped thumb pencil grip. A variation on the wrapped thumb, is the tucked thumb grip. Instead of wrapping his thumb, this child has tucked his thumb into his pencil grip, and holds the pencil very tightly. When a child is compensating for poor tactile perception or weak shoulder muscles, he may hold the pencil very tightly, which results in an inefficient pencil grasp. The tips of the fingers are gripping the pencil very tightly, and the pencil is standing straight up. This pencil grip blocks the finger movements needed for good handwriting, and is very tiring. Most of the poor pencil grips displayed below, were used by children who did not get much opportunity to develop their fine motor skills before starting formal schooling. This child holds the whole arm off the table, and the awkward pencil grip has resulted in very poor control over the pencil. This child is balancing the crayon between her index and ring fingers with the middle finger on top. The thumb is not being used at all. This boy is using a pencil grip called an interdigital brace - "interdigital" means that the pencil is braced between the fingers. He is using a pencil before his arm and hand have had enough fine motor experiences to help the fingers work together. This very tight pencil grip balances the pencil between the thumb and index finger; the other fingers are tightly balled into the palm of the hand. 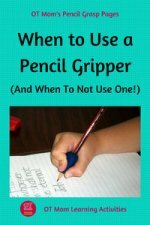 If your child's poor pencil grip is affecting handwriting and causing pain and fatigue, then just telling your child to “hold the pencil better” is NOT going to help! If you are in any way concerned about your child's pencil grip, get a professional opinion. 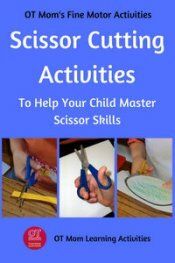 I recommend an occupational therapy assessment to help figure out whether your child is compensating for other weak skills, or whether your child has missed out on some developmental stage along the way. 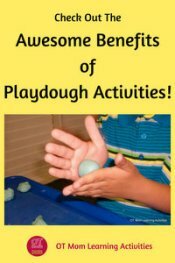 The information on this page is not a substitute for occupational therapy! 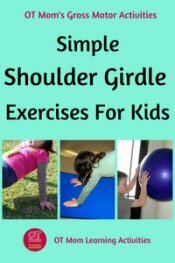 Don't forget to also work on gross motor skills such as core muscles and shoulder girdle muscles, as these lay an important foundation for fine motor skills. 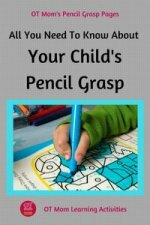 Still looking for more information about pencil grasp? Thanks for visiting, I hope you were helped! Why not sign up for my newsletter to stay in touch with new pages and activities on my site!